Hank Nothhaft looked at himself in the mirror and realized that, after three decades, he was los­ing his passion for his work. He needed a new challenge, one that satisfied his all-encompassing, adrenaline-driven, compulsive lifestyle. Hello Thoroughbred breeding and racing. A decade of immersion into every­ thing horses has yielded significant results for the 74-year-old Nothhaft, a native of Pennsylvania who has traveled the world in both his military and civilian lives. 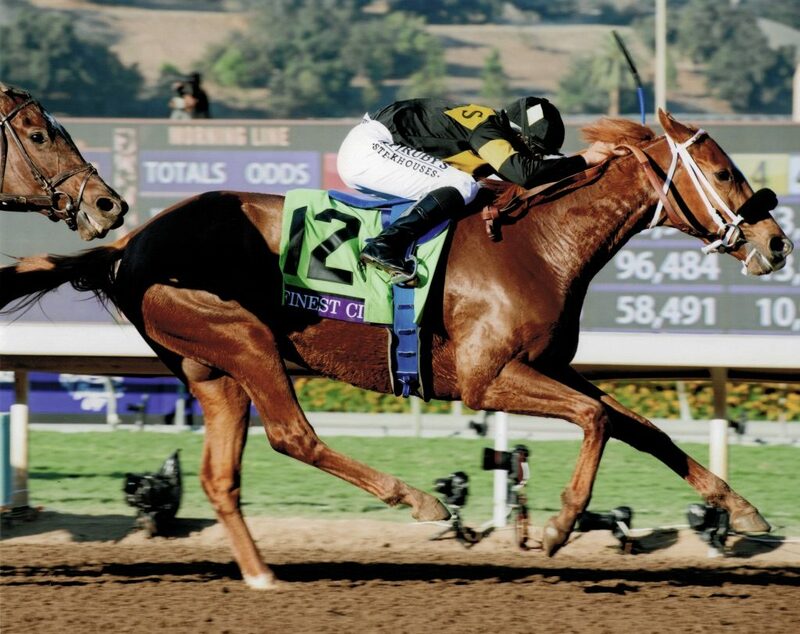 Under HnR Nothhaft Horse Racing (the “R” coming courtesy of wife Randie) Nothhaft has bred Breeders’ Cup Champion Finest City, multiple graded stakes winner Daddy ls a Legend , and multiple stakes-winning homebred Grand Prix. He has also campaigned multiple graded stakes winner Living The Life and multiple grade 2-placed stakes winner Kindle, and has specialized in purchasing modestly­ priced stock that has gone on to perform on the racetrack and in the breeding shed. Those good feelings persuaded Nothhaft to take up the challenge of trying to survive in the horse industry, initially as an owner . “I analyzed a bunch of different industries, and I ended up with Thorough-hred racing,” he said. ” I do look back and chuckle at my naivete in thinking I could do what has subsequently occurred. I love the competition and the immediate feedback you get on your decisions . Nothhaft did his homework. 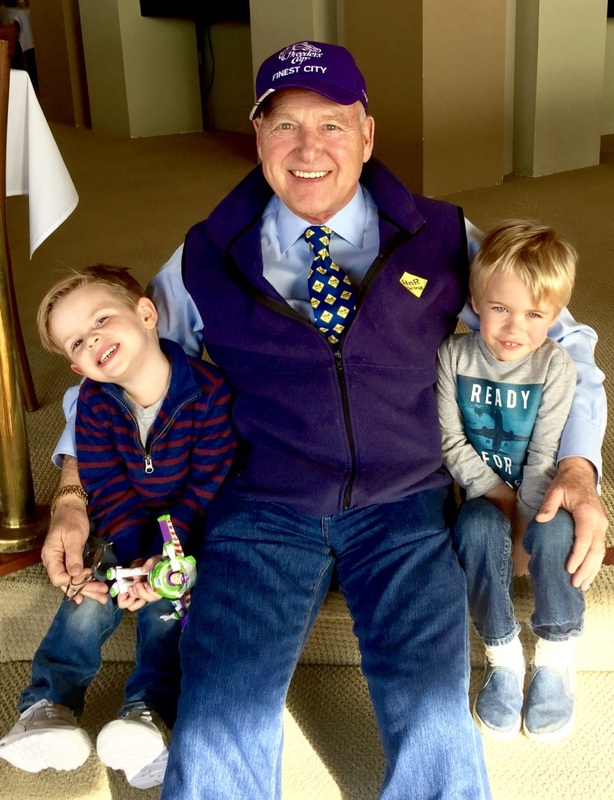 He attended seminars put on by the Thoroughbred Owners of California, watched BloodHorse videos on conformation, read books, and then went out and raced some cheap claimers in Northern California, seeking to have fun, enjoy the competition, and hopefully break even. ‘The plan didn’t work well, and Nothhaft used the economic meltdown of 2009 to liquidate his stock, learn from his early mistakes, and start over again. With the benefit of advice from Gary Mandella and Mary Knight, he began buying better Cal-breds. Chalking it up to “dumb luck,” he bought Randie’s Legend at auction for $ 43,000 in 2008 . She would go on to produce Daddy ls a Legend. But Nothhaft turned the corner when he decided that Pennsylvania offered more opportunity than did the situation in California. 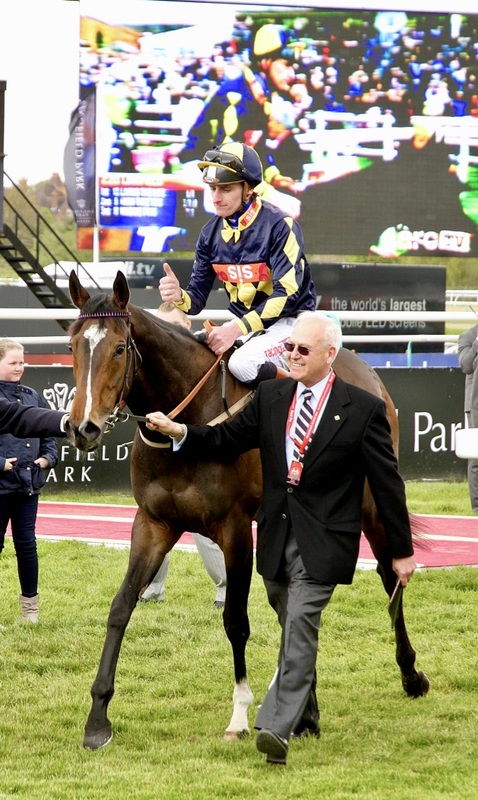 He enlisted Carl McEntee to help buy bloodstock and the operation clicked. Nothhaft grabbed Kindle for $50,000, Be Envied for $37,000, Living The Life for less than $50,000, and Halljoy, who would become group stakes -placed. for $150,000 . All became valued members of his broodmare band, with Be Envied producing Finest City and Grand Prix. 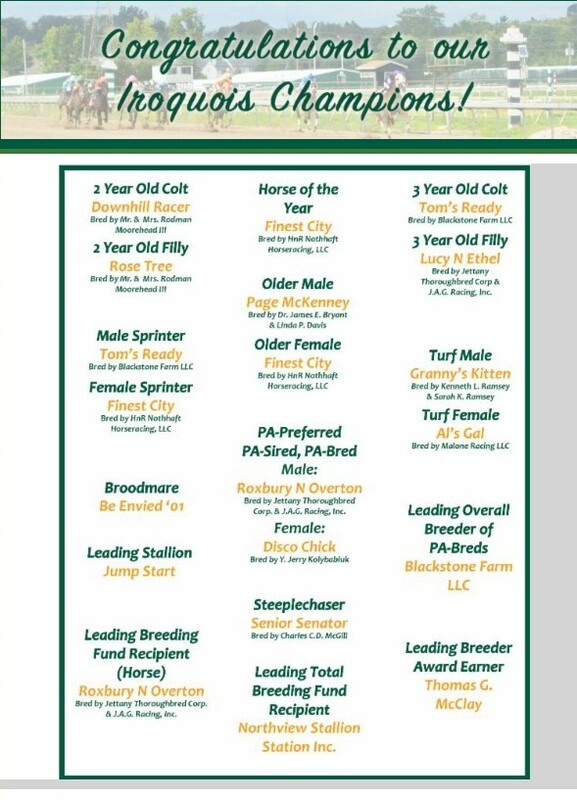 ‘Today, Nothhaft’s 10 broodmares produce Pennsylvania-breds after being bred to Kentucky stallions, and he him­self is on the board of the Pennsylvania Horse Breeders Association. Most of the mares Nothhaft owns today either raced for him or were bred by him, the notable exception being Sulis, whom he bought specifically to breed to Silver Train, a stallion Nothhaft bought and stood in Pennsylvania, hut who died after just two years. 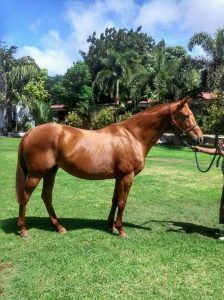 Having paid $105,000 for Sulis, a daughter of Maria ‘s Mon, Nothhaft proceeded to sell weanlings out of her for $250,000, $130,000, and $ 220,000 within four years. As legendary Kentucky horseman Robert Courtney used to say, that’s how you make money in this business. Because the Pennsylvania incentive program is going well, Nothhaft said he might increase his mare population to 15, but generally he is concentrating on improving the quality of the band rather than increasing its number. “Carl and I made a decision not to take the risk of raising them to be yearlings .” Nothhaft said of his early preference for selling weanlings . “At least until now. The yearling market is crazy right now so I’m not unhappy to hold onto them another year because the financial advantage is shifting that way. 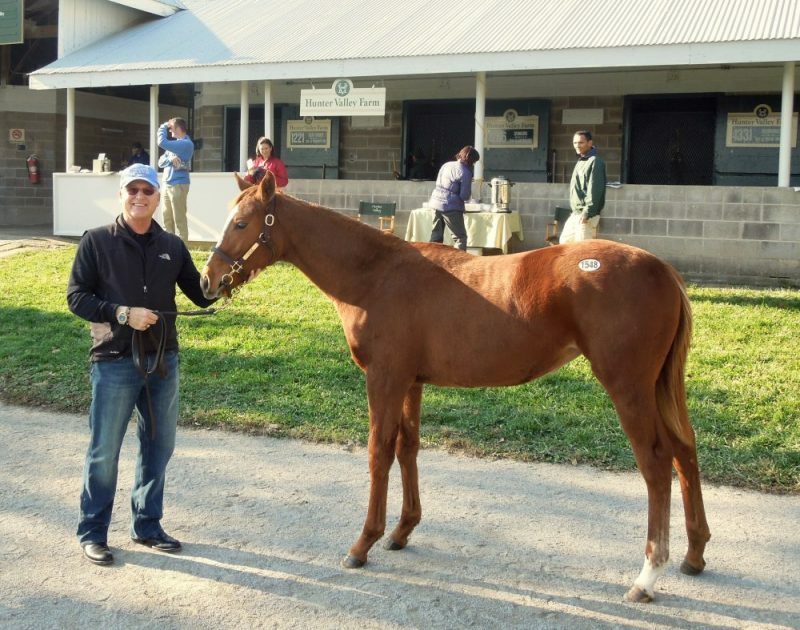 That hasn’t always been true.” That updated strategy comes in part from the American Pharoah-Kindle weanling colt Nothhaft sold for S400,000 who was pin hooked by Peter O’Callaghan and sold for s2.2 million at last September’s Keeneland yearling auction. Nothhaft supported McEntee during the latter’s time at Darby Dan Farm and has helped bankroll McEntee’s move to open Ballysax Bloodstock, which now consigns the Nothhaft-breds. “Carl is all energy and is a hard worker,” said Nothhaft. “In his first year in 2018 he’s had good-quality consignments and gotten good results. In the past, Nothhaft annually compiled what he now calls a “fantasy list ” of stallions for his mares, where he and McEntee would generate a roster of studs that fit his mares although they knew they wouldn’t he able to get to those stallions. Today, it is a different story. “Now that I have better mares. we know we’re able to get to all the stallions on our list this year.” said Nothhaft. “So we’re not playing fantasy football anymore.” Nothhaft bought back a Pioneer of the Nile-Kindle weanling colt in November 2018 on a final bid of $375,000. 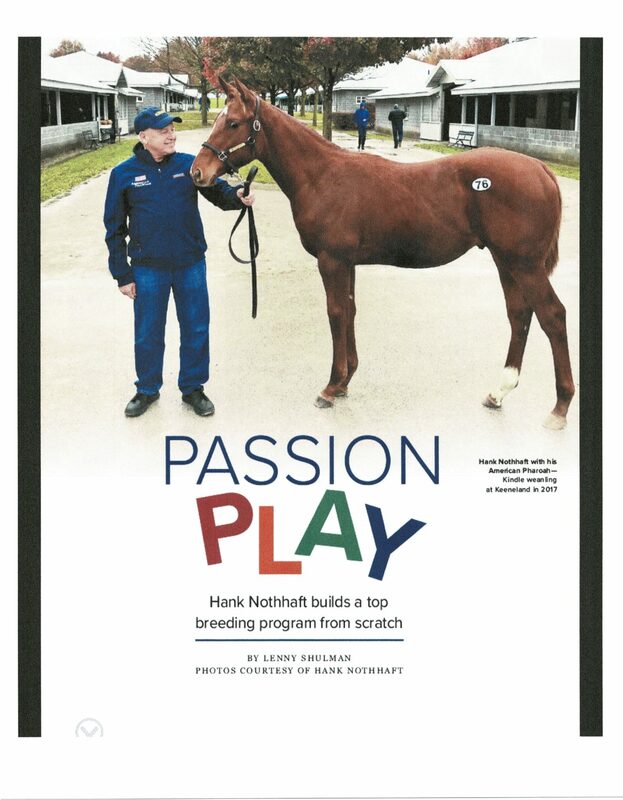 He .also kept an American Pharoah-Halljoy year­ling filly who RNA’d for $335.000. Those babies are indicative of the quality of stallions to whom he now sends his mares. “This is a very faddish industry in my opinion,” he stated. “So going to American Pharoah in his first year-if you pick the right first-year stallion it can be a bonanza when you’re selling the progeny. Certainly American Pharoah was a good pick. So we do use some select first-year or young stallions, we call ‘Living the Dream stallions.’ They don’t have anything running yet, or at least won t before (the progeny) sell. Nothhaft has worked diligently to try and help ensure that the Pennsylvania incentive program remains on sound footing, although that has proven to be a tricky enterprise in the past. 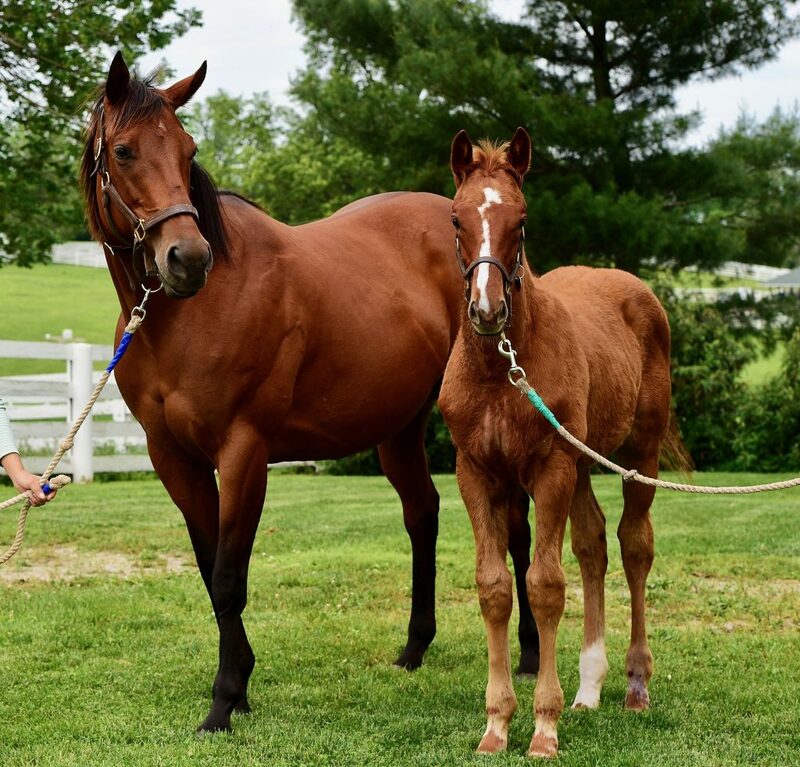 ”Pennsylvania has had a great program for years,” said Nothhaft, “except that the state (government) kept coming up short on funds and taking money away from the breeding program for the general fund. As a breeder, you never knew what was going to be there going forward. What we’ve done is put the program in a trust; while that can still be broken, there is a significant penalty for the state if it decides to take funds away, so we feel more comfortable going forward. A dose of naivete represent standard equipment for those seeking entrance to the Thoroughbred industry as a business proposition . And the addition of successful business people such as Hank Nothhaft to its ranks swells the legitimacy as well as the feasibility of this world of horses. He has embraced a challenge far too puzzling for most; entered on the ground floor and built a sturdy operation upward despite knowing nothing about its workings when he started. That horses can rekindle this sort of passion in a person of substance such as Nothhaft is a huge positive. 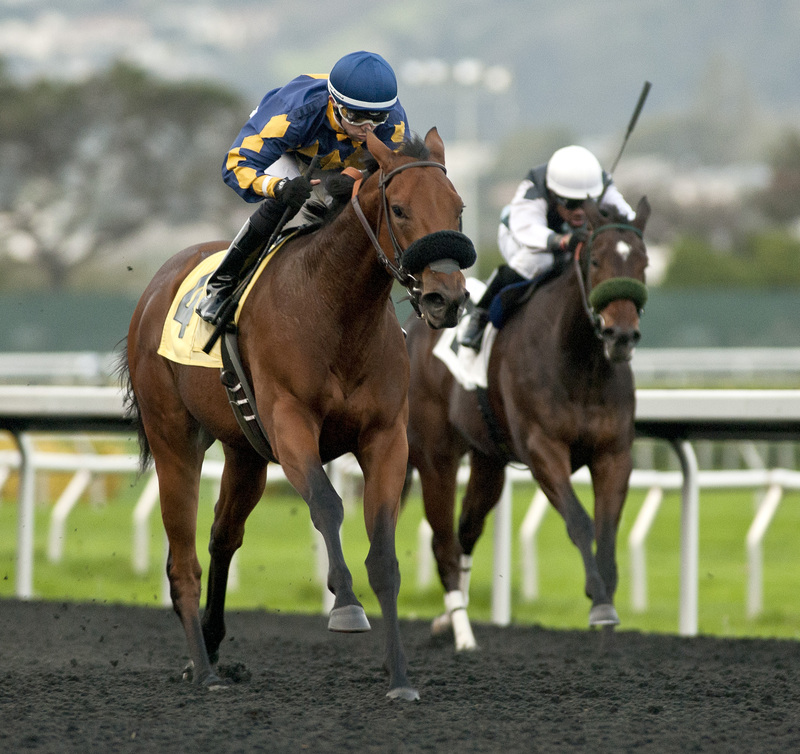 Finest City will represent her namesake city-San Diego-in the 2017 Breeders’ Championships at Del Mar on November 4th and then be presented for sale at the Fasig-Tipton NIght of the Stars Auction on November 6th. Given her breeding and on track accomplishments, Finest City will command strong interest and most certainly will be a 7 figure sale. 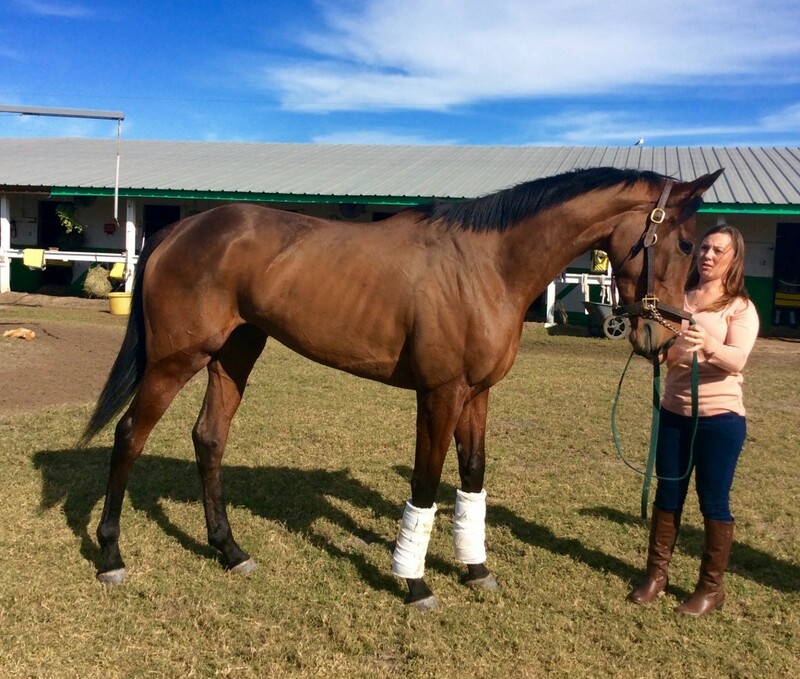 Below is a link and copy of a Daily Racing Form Article summarizing this latest adventure. 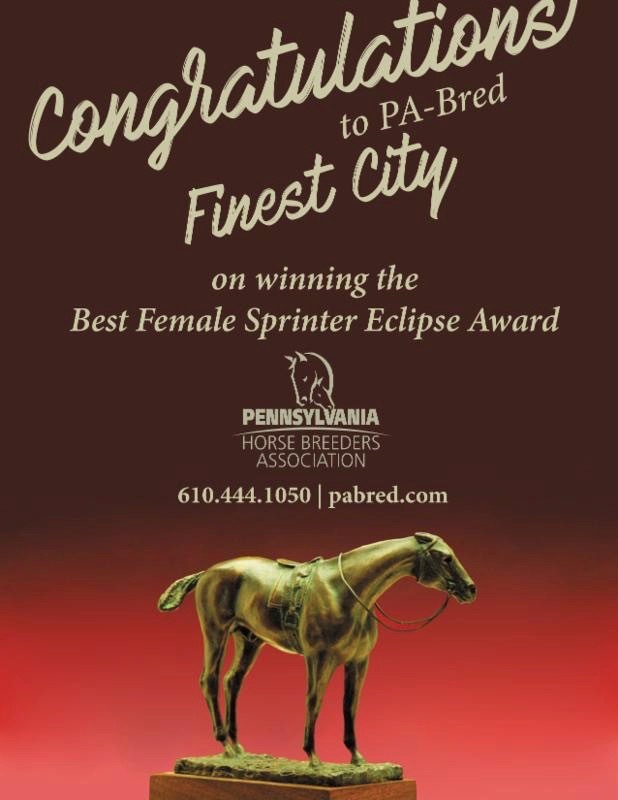 Finest City half sisters Grand Prix and Move, also PA_Breds continue to compliment Finest City and vise versa. 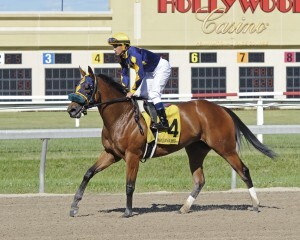 Grand Prix, already a stakes winner, and Move will be entered at PARX on Pennsylvania Day at the Races Sept 2nd.. 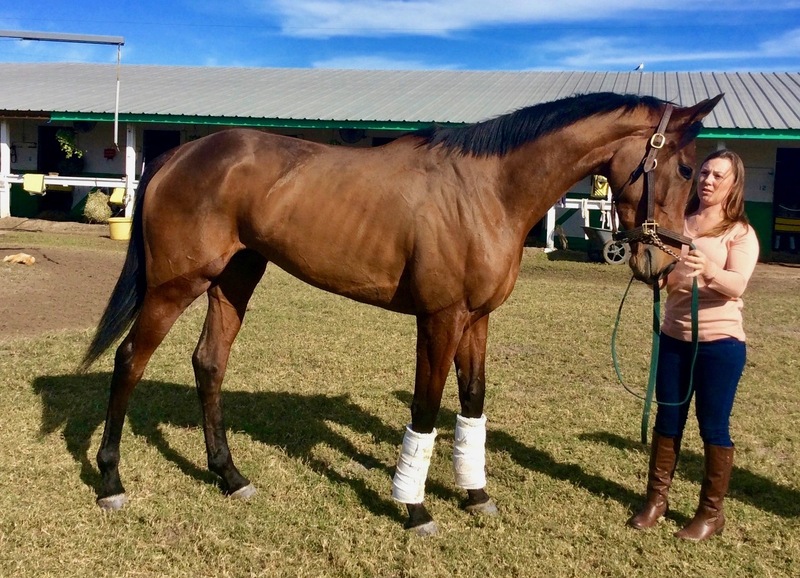 Demonstrating the versatility of broodmare Be Envied, Grand Prix will be sprinting 6 furlongs on dirt, while Move will be going 1 1/16 mile on the turf. Grand Prix is by Tale of the Cat while Move is by Silver Train. Finest City, the champion female sprinter of 2016, will be offered at this year’s Fasig-Tipton Kentucky fall selected mixed sale, two days after a planned start in Breeders’ Cup Filly and Mare Sprint at Del Mar on Nov. 4. The 5-year-old City Zip mare won last year’s edition of the Filly and Mare Sprint at Santa Anita en route to her Eclipse Award honors. 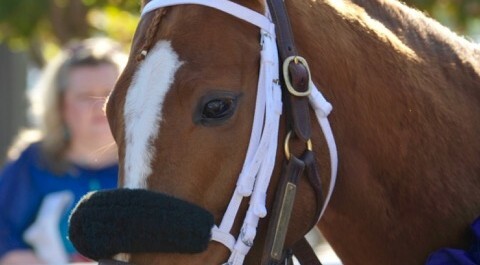 Finest City has won 5 of 19 starts for earnings of $1,256,394. In addition to her Breeders’ Cup score, she has won the Grade 2 Great Lady M. Stakes and Grade 2 Santa Monica Stakes, and her seven graded placings include four in Grade 1 company. Ian Kruljac trains Finest City for owner Seltzer Thoroughbreds. Kruljac will consign the mare as agent for the owner at the Fasig-Tipton sale, which will take place Nov. 6 in Lexington, Ky. 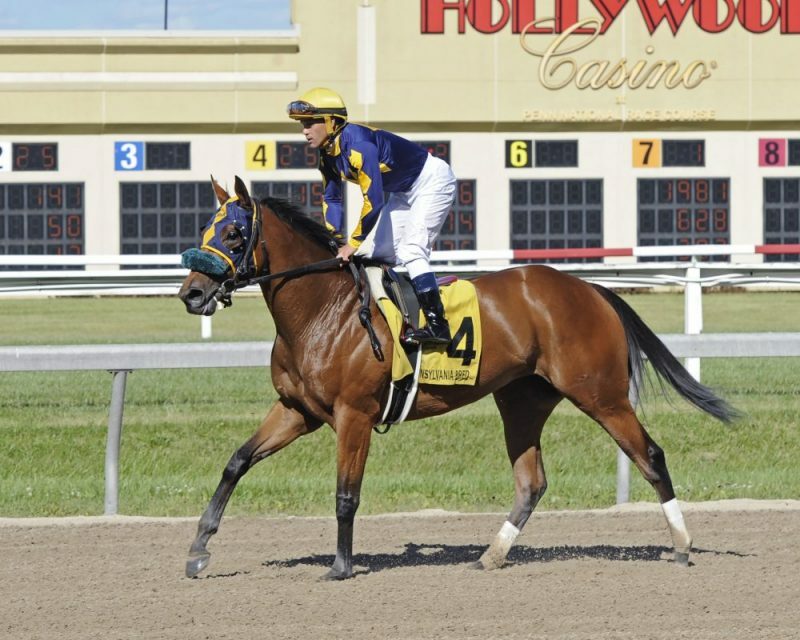 Bred in Pennsylvania by HnR Nothhaft Horseracing, Finest City is out of the stakes-placed Lemon Drop Kid mare Be Envied, whose three foals to race are all winners, including stakes winner Grand Prix. Her extended family includes Grade 1 winner Burning Roma and Grade 3 winner Vivano. 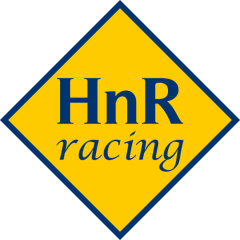 After beginning her career in California, HnR Nothhaft Horse Racing’s homebred Grand Prix made the first foray in the state of her birth a successful one as she tri­umphed in the $100,000 New Start Stakes, the first stakes on the Penn Mile undercard. A half-sister to champion Finest City, also bred by Hank Nothhaft, Grand Prix was sent off as the second choice behind 2016 Pennsylvania-bred champion 2-year­ old filly Rose Tree. With Javier Castellano aboard for trainer Gary Mandella, Grand Prix stalked the early pace set by long-shot Risque’s Diamond through the opening quarter of the 6-furlong test. While racing outside horses, the winner then took the lead on the turn and increased that lead to 2 lengths in mid-stretch. Castellano kept her mind on business to the wire and she won by a length over the rallying Rose Tree. The final time was 1:09.61. Nothhaft, who stood the late stallion Silver Train at Northview PA, where Grand Prix was foaled, shipped the daughter of Tale of the Cat to Pennsylvania from California several weeks before the New Start Stakes to take advantage of the state’s incentive program . 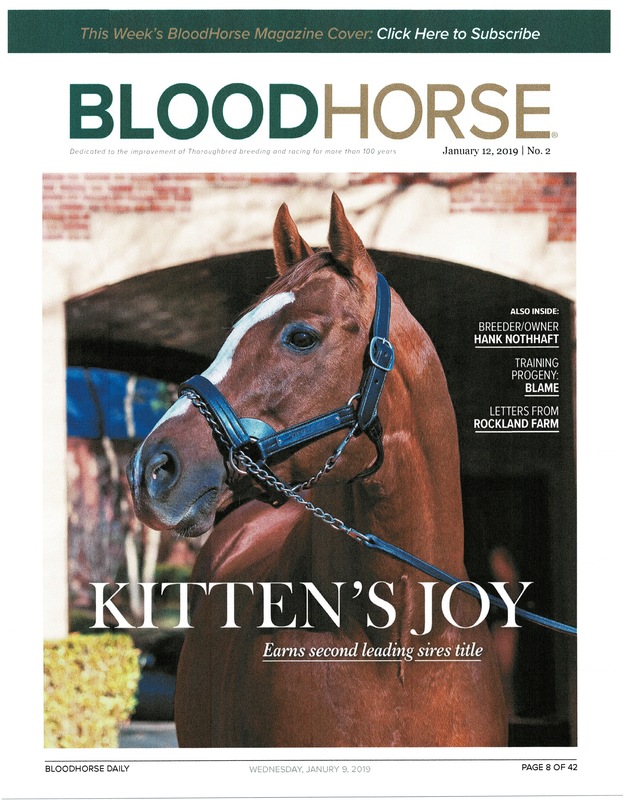 ” Grand Prix is a late foal [April 28) and is still maturing,” said Nothhaft. “Also , she runs well on turf, dirt and Tapeta. Depending on her performance going forward I can shoot for the Presque Isle Downs Masters Stakes-G2 in September or fall back on the original plan to pursue the Pennsylvania-bred circuit. 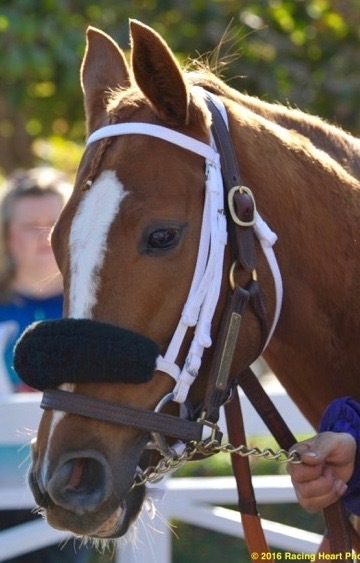 Being from Sharon, Pa., the Masters is a special race for me, and maybe Grand Prix will get me back there for the fourth year in a row.” Living The Life (IRE), a multiple graded stakes winner and millionaire campaigned by Nothhaft, won the Masters in 2014 and ’15 and finished second in 2016. Grand Prix, out of the Lemon Drop Kid mare Be Envied, earned S60,000 for the New Start and sub subsequently finished second in a June 26 allowance at Penn National against older mares to boost her career bankroll to $126,510. 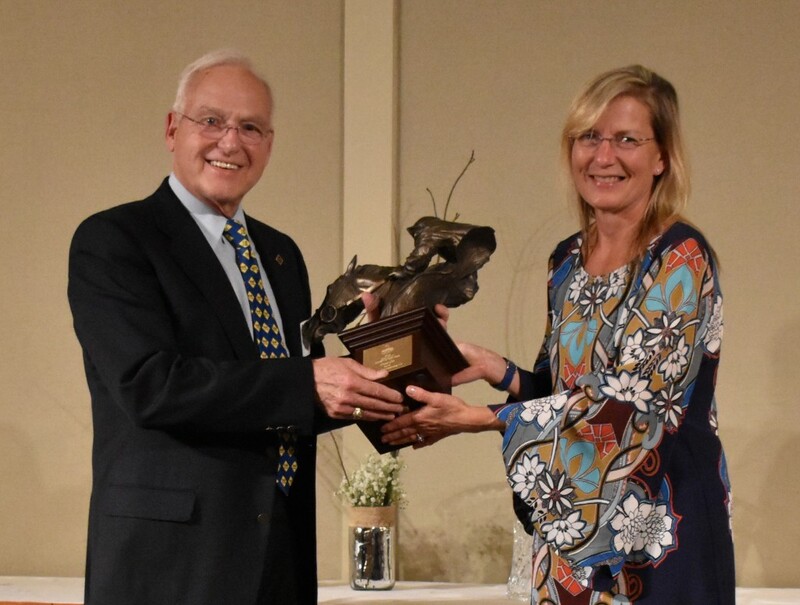 The Pennsylvania Horse Breeders Association (PHBA) hosted Its’ 38th Annual Iroquois Awards Banquet on June 9 at The Hershey Hotel. PHBA members, the board of directors, and top Pennsylvania breeders and owners were present for a great night of dinner, cocktails, and conversation. 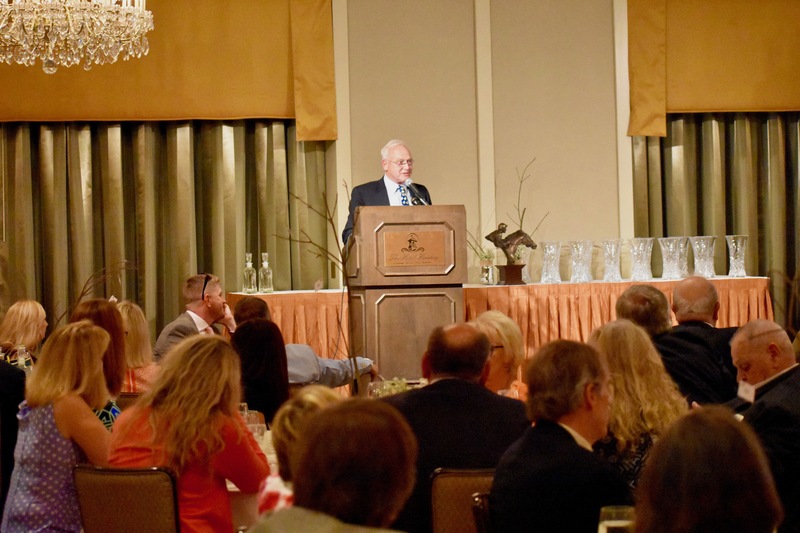 Brian Sanfratello, Executive Director of the PHBA, served as Master of Ceremonies for the gala evening. 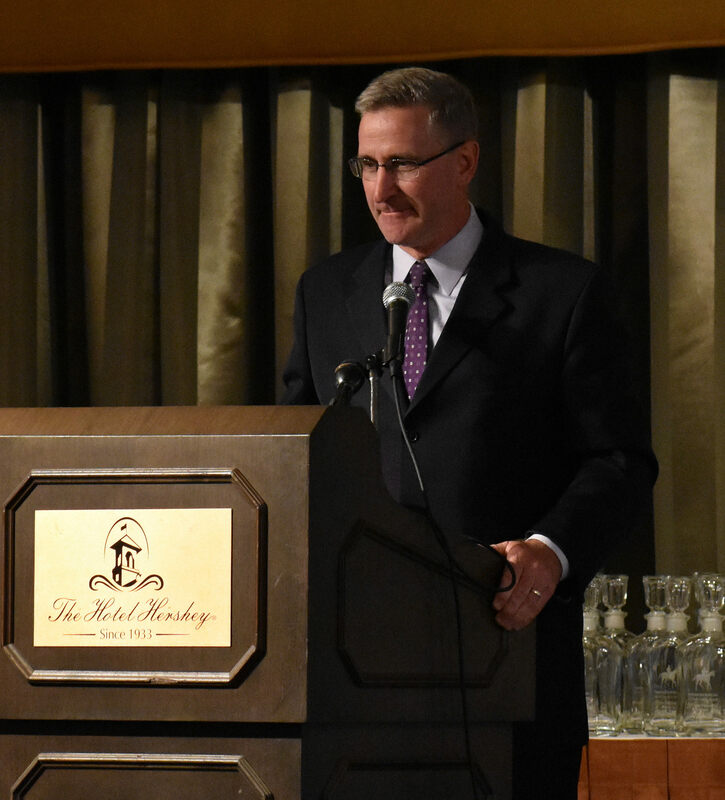 Roger Legg PHBA President offered his greetings and welcome to the assembled group, while the Honorable Russell Redding, Secretary of Pennsylvania Department of Agriculture provided insightful comments on the current status and support by PA for the thoroughbred industry. Henry “Hank” Nothhaft provided the Keynote address describing his journey to breeding Finest City, one of four, and the first PABRED Breeders’ Cup Champion in 24 years, and Eclipse Award Winner as Best Female Sprinter. Click on the link below for the full script of Hank Nothhaft Keynote. Impressive Crystal Trophies were awarded for a number of categories. Click on the link below to view photos PHBA Crystal Awards. See the full list of Category Winners listed Below. Hank Nothhaft owner of HnR Nothhaft Horseracing accepts Horse of the Year Award for HnR PABRED Finest City. 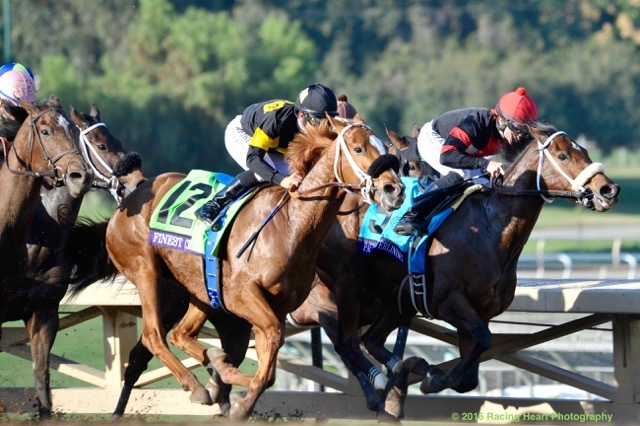 Bred by HnR Nothhaft Horseracing LLC, Finest City, a PA_BRED, not only proved the best distaff sprinter of 2016, but acquitted herself around two turns on dirt and turf as well. It illustrated the mare’s versatility, though in the end, she demonstrated her keen sprinting ability by beating the best in the Breeders’ Cup Filly & Mare Sprint (G1) to clinch the Eclipse Award as top female sprinter. Graphics courtesy of Keeneland and the PHBA. 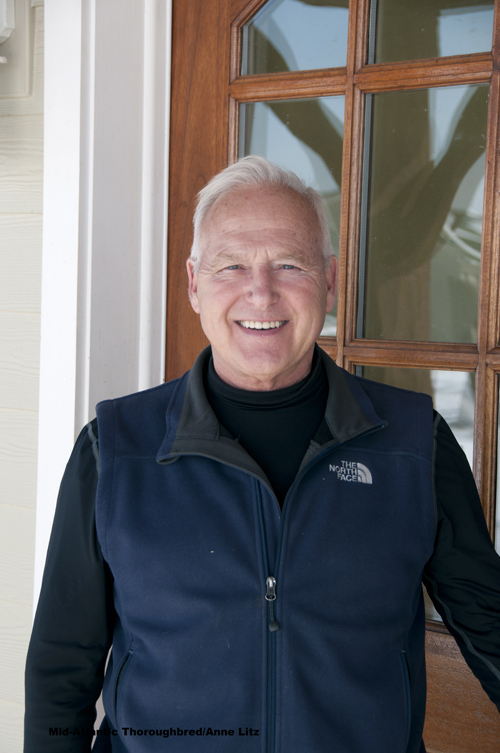 Henry R “Hank” Nothhaft got involved with racing toward the tail end of a career in the high-technology industry knowing he’d need a challenge and something to feel passionate about as retirement loomed. “I didn’t know anything to tell you the truth. I didn’t know how little I really knew. 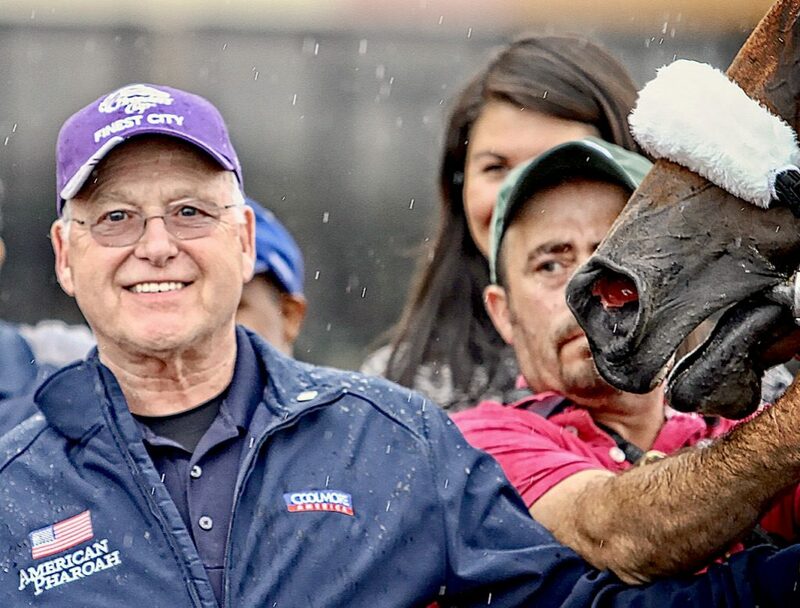 I thought I knew about it, but after a while I realized how naive I really was.” Nothhaft, a first generation American who grew up in Western Pennsylvania and runs his operation HnR Nothhaft Horseracing, admits he’s still got plenty to learn, but he also knows now what it feels like to breed a winner at the Breeders’ Cup World Championships. Nothhaft found that out Nov. 5 as Pennsylvania-bred Finest City upset the $1 million Breeders’ Cup Filly and Mare Sprint G1 at Santa Anita Park. Ironically Nothhaft’s first Breeders’ Cup victory came in a race he was expected to be represented as an owner, with Living the Life (IRE), who missed the race due to injury. Nothhaft watched the Breeders’ Cup from his home in Saratoga CA, with his family, and Finest City’s three-quarter-length win over 2015 Filly and Mare Sprint winner Wavell Avenue factored heavily in a huge weekend for her breeder. The day after Finest City’s victory, Nothhaft was on hand at Golden Gate Fields to see her 2 year old half-sister, the Pennsylvania-bred Tale of the Cat filly Grand Prix, break her maiden in her fourth start. Nothhaft relished those victories, along with several other on Breeders’ Cup weekend that bolstered his breeding program. “Given my horses and who I’m planning on breeding to, it couldn’t have been any better,” he said. “I have a Gio Ponti and a Gio Ponti won (the Sprint) with Drefong. I haves a Pioneer of the Nile and I’m considering him as the breeding choice for Living the Life and Kindle, another mare I own. He won (the Juvenile) with Classic Empire. I have a Tiznow colt on the ground and Tourist won (the Mile). I’m a City Zip maniac and Finest City won. Nothhaft, McEntee and Hunter Valley’s Fergus Galvin hoped the filly would bring as much as $150,000 after all the presale action, but were conservative in putting her reserve at $50,000. “When she sold I went in the room–this was the first horse I ever bred that I sold–and there was some bidding initially but it started slow; ran up in small increments,” Nothhaft said. “The last bid was $50,000 and she sold. I couldn’t understand it, Fergus couldn’t understand it, Carl couldn’t understand it. Well, we go back and it comes to our attention that we thought the X-rays were clean, but it turns out the last set taken weren’t completely clean. 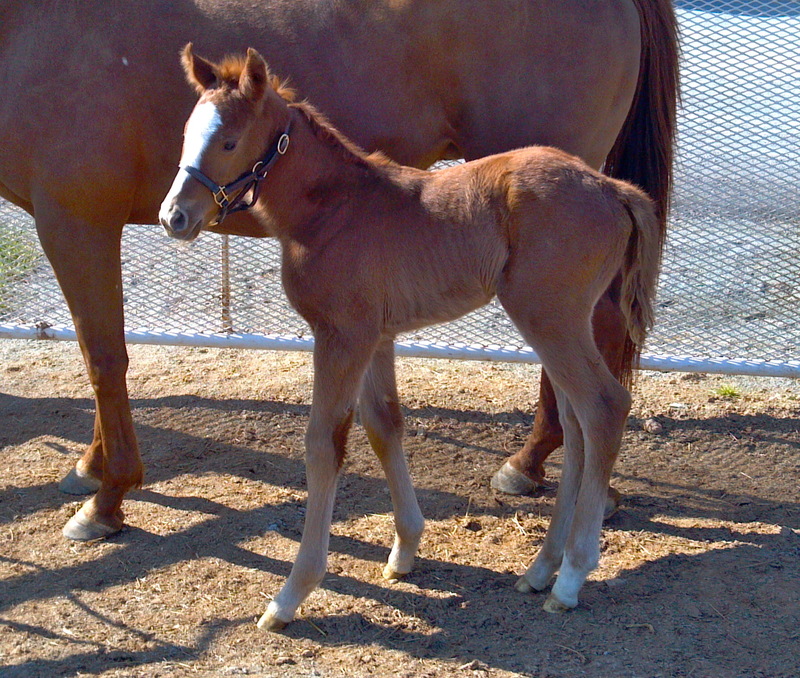 She had a small OCD issue, and selling as a weanling basically to pinhookers, that’s tough. 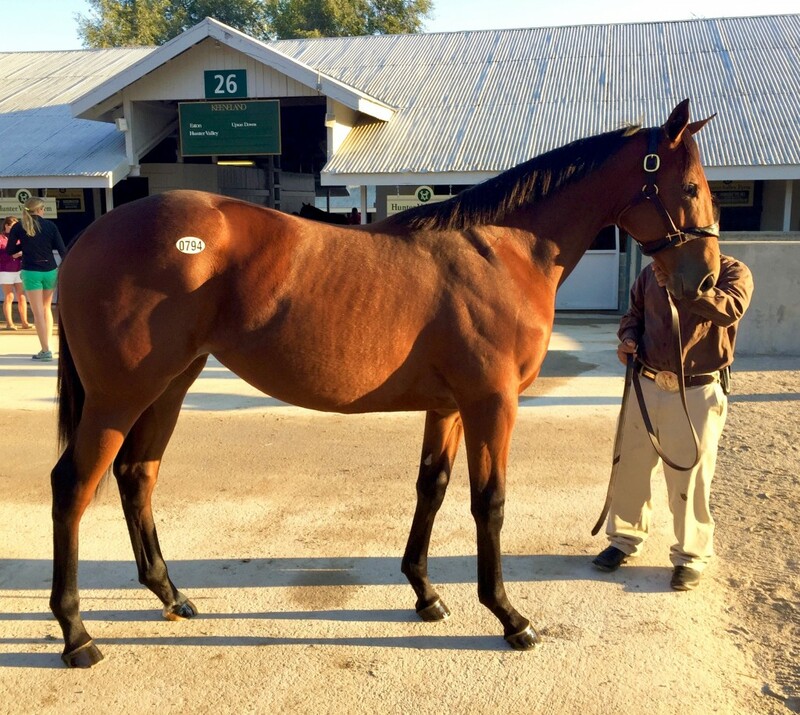 The people that were looking at her were flunking her and moving on to somebody else, but we didn’t know it at the time.” Cobra Farm bought the filly, and resold her for $85,000 at the 2013 Keeneland September yearling sale to Seltzer Thoroughbreds, which celebrated her victory in the Filly and Mare Sprint with trainer Ian Kruljac. Nothhaft bred Be Envied to Silver Train and she produced a filly, subsequently named Move in 2013. Nothhaft sent Be Envied to Tale of the Cat in 2013, the resulting foal being the winner Grand Prix, and Silver Train died after standing in the Southern Hemisphere in December 2013. Be Envied was bred to Tale of Ekati and later in the year was entered in the Keeneland November sale. She failed to meet her reserve on a final bid of $24,000, but was sold privately after going through the ring to representatives of breeders in India. Though he was the only winner, Nothhaft wasn’t the only Mid-Atlantic breeder at the Breeder’s Cup. 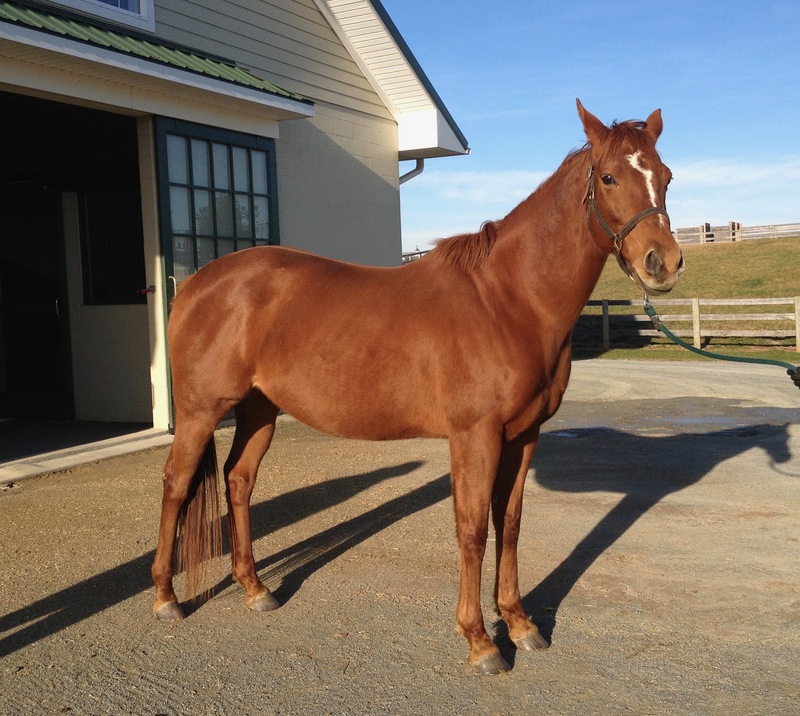 Six horses bred in the region competed in the 13 races-four in Pennsylvania, one in Maryland and one in Virginia.